In a video a non-profit pro-Israel organization, make a mock implementation of an Israeli soldier and a team of armed children run from a Hamas terror tunnel. The children, apparently older than the age of 7 , operate from a tiny tunnel with brush and leaves covering it. 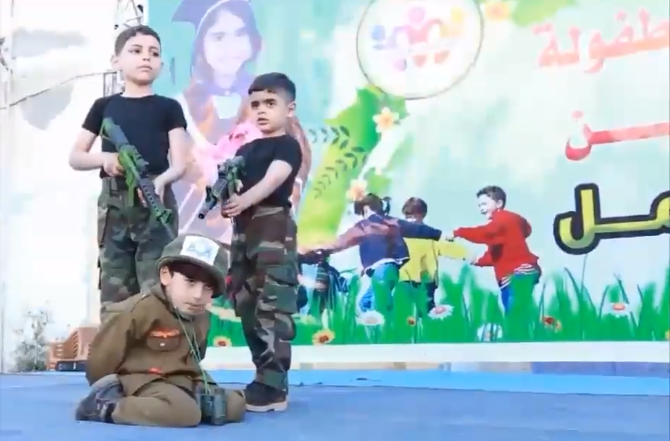 After running and marching their skit of shooting in their enemies, both two children stand another kid on his knees over wearing an Israeli soldier’s uniform. The movie is reminiscent of ISIS videos coaching children to become future members of ISIS. Videos show young children, known as “cubs of the caliphate,” executing enemies of ISIS and being brainwashed to become future ISIS members. Hamas is a terrorist network which has called for Israel’s destruction.